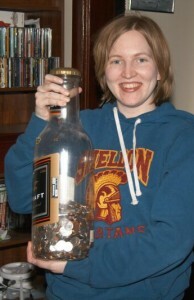 For roughly the last 10 years I’ve been emptying the loose change from my pocket and tossing it into a novelty sized beer bottle piggy bank. I never seem to miss the stuff, so it’s been an easy way to save. After our recent unexpected expense we decided it was time to open that sucker up and see just how much was in there. My initial guess was somewhere between $500 and $600 dollars. Turns out I was right on the money. Ashley declined the chance to speculate. During our last visit to the bank we picked up a stack of paper coin rollers for free. Finding some time in the evening, we sat down at the table and got to work. Right off the bat things were not going well for me. Having never really rolled coins in bulk before my technique was terrible. Coins kept getting stuck in the tubes sideways, and I was mangling the paper edges quite badly. After some colourful language, Ashley showed me the way. Count out the coins you are going to put in a roll. Cup your hands, and shake those coins lightly. This gets them to start lining up and speeds up the next step. 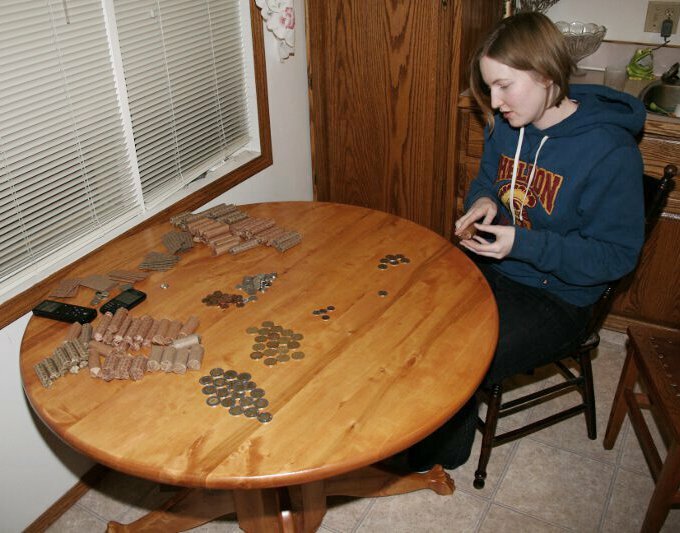 In one hand, line all the coins end to end the way they would fit into the roll extending from the edge of your outstretched fingers towards the palm. Take your free hand and open up the paper coin roller by placing one finger inside of it. With the coins all in a row and slightly leaning back, slide the paper roller over all the coins at the same time. It helps if the roller’s folds line up with the top and bottom of the coins. Fold over both ends of the roller and repeat. Once I got onto Ashley’s technique, I was much more productive. In total, it took the two of us 1 hour and 50 minuets to get everything rolled. In the end, we managed to add $547 do our travel funds. quite an significant amount of change! Congrats, guys!